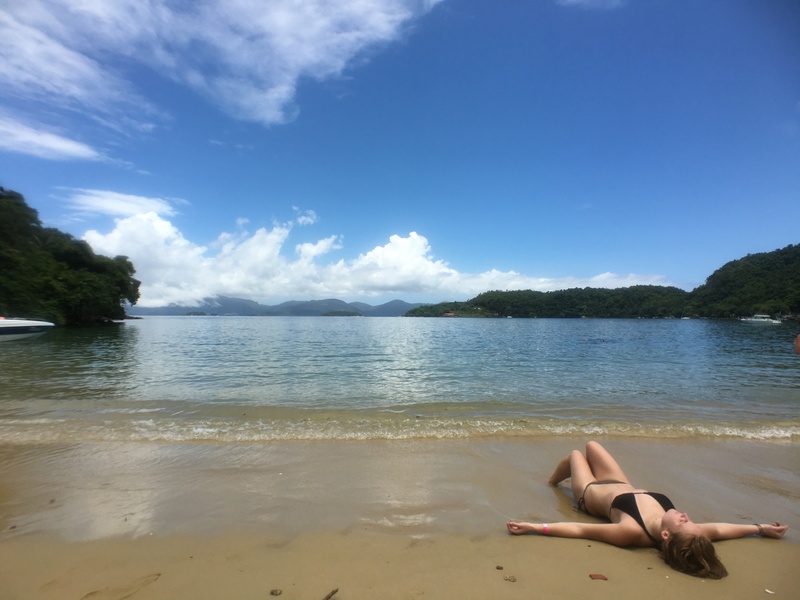 Ilha Grande, Brazil – Backpackers United! Over the last year I have found myself more and more drawn to traveling and just last month I led my first group trip of first time backpackers. We went to Brazil for ten days and it rained for the first 8. 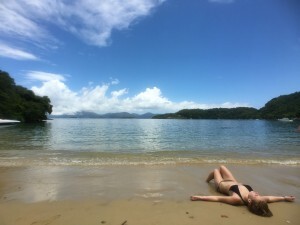 I had tried to prepare everyone with blogs about all sorts of facets of travel in advance but, of course, everyone had expected Brazil to be a tropical “lay on the beach and get tan” type of destination and the rain prevented that. So we went ocean kayaking and went to museums and cathedrals and we went snorkeling and night snorkeling and mountain climbing and exploring. But on the eighth day all seven of us signed up for a “paradise island tour” where we were to take a speed boat out to a bunch of little islands with pretty beaches. As we were leaving the tour office the tour operator asked us if we would prefer to postpone our tour until the next day because the weather was supposed to be better. Unfortunately we told him that the next day we had plans to travel to a different city and so it was today or never. He offered some half-hearted optimism and said that it was possible that because the islands were on the other side of some mountains that the weather may be clear over there so the seven of us set out in the speed boat. We put our towels and t-shirts in the cubbies below our seats so that they wouldn’t be soaked. The rain whipped and stung coldly as the boat accelerated and for fifteen miserable minutes we were try to stay upbeat, holding out and trying not to be the first person to complain. On the first island it was raining but we threw some bread in the water and went snorkeling with the fish. The second island it stopped raining but it was overcast. We played on the beach and took a bunch of goofy group photos and then as we were approaching the third beach we could see blue sky miles away in the distance and we each said a silent prayer asking for the sun. And then just like that, as we were preparing our stuff to get out of the boat, I felt the sun touch my skin, I turned and the clouds parted and it was the most beautiful beach and the most magical moment. It was the highlight of the trip for me because the group could have easily fallen apart, people could have become discouraged at any point along the way, but they held together and I was a part of that and I feel like that day and that beach and that moment and that feeling was the reward. Moments like that are what it is all about for me, and sharing them with others is the most rewarding feeling. I just want to do that over and over and over.